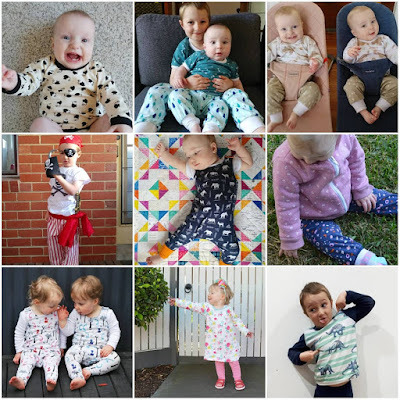 Last week my biggest little brother celebrated his birthday. It had been a few years since I had made him a quilt (and his previous one was a bit too small), so I thought I'd make him a new one. I was more organised this time around, and worked out what I wanted to make for him ahead of time. 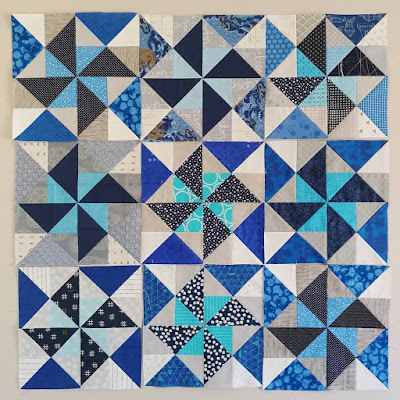 I chose the Spinwheel block in blues and greys as my bee block for my turn as queen bee in November last year. I received 14 beautiful blocks from my bee members and made the remaining blocks earlier this month. 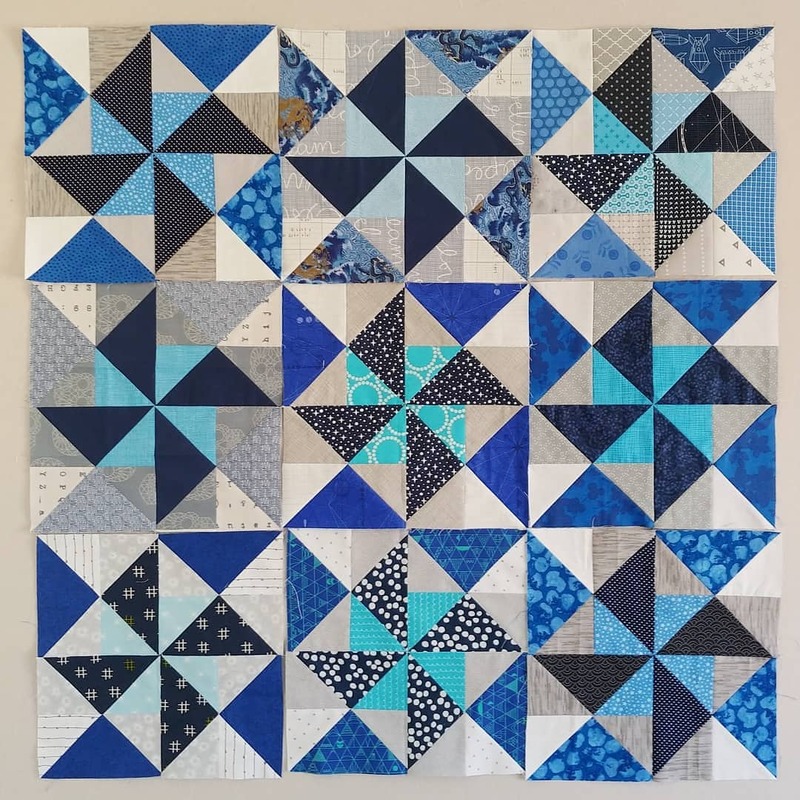 I made it nice and big (54" x 78"), since my brother is a tall man. I love the variety of different prints used for the blocks and how well they work together. 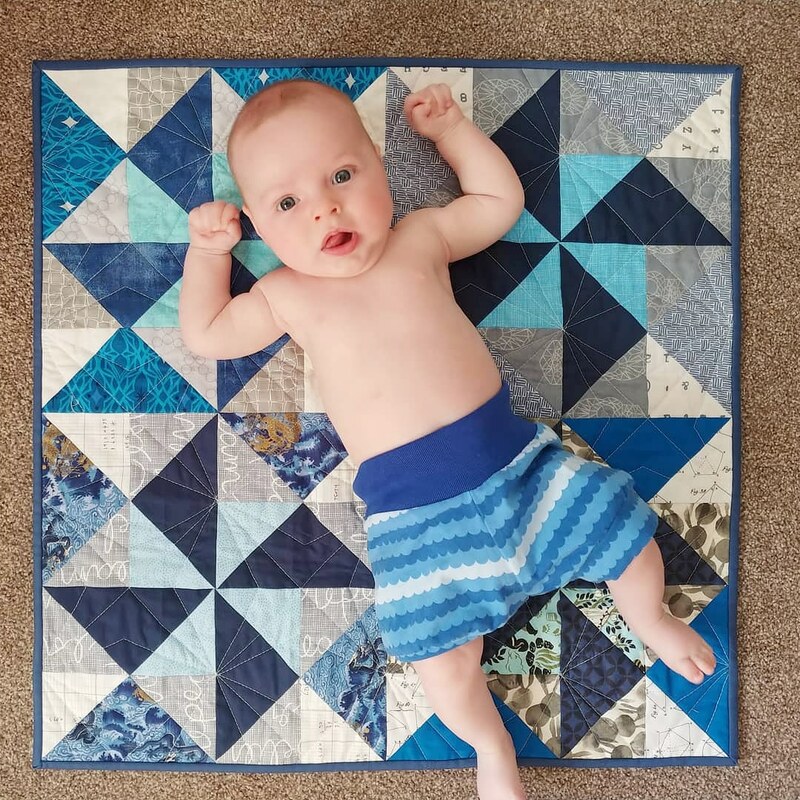 I didn't have time for a glamorous Quilts in the Wild pic (this was taken outside the local Police Station), but it did arrive in time for his birthday today. 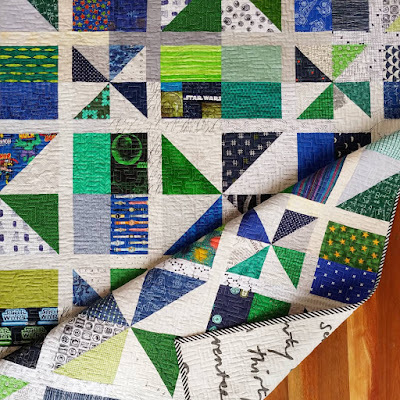 I hope this quilt will see lots of use as a couch blanket, picnic rug, something to keep my brother warm during his fishing adventures, or even just a big quilty hug when he is feeling lonely. 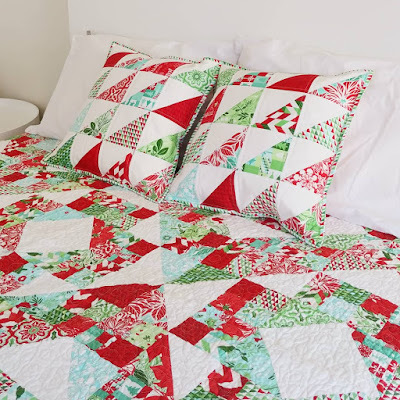 I'm linking up with the Elm Street Quilts One Monthly Goal, and the 2019 Q1 finish-along as finishing this quilt was my goal for this month, and one of my proposed finishes for quarter 1. 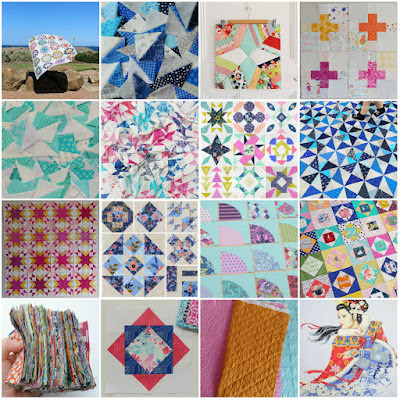 Just a quick post to link up the final finish from my list of proposed finishes for quarter 4 of the 2018 finish-along. They're made using prints from Kate Spain's Jingle collection - one of my favourite festive collections. These pillows were make from the leftover HSTs from the quilt I finished on boxing day last year. 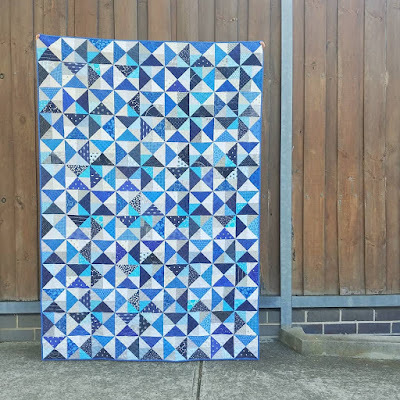 Today's quilty finishes catch up post is about my recently finished Glisten quilt. 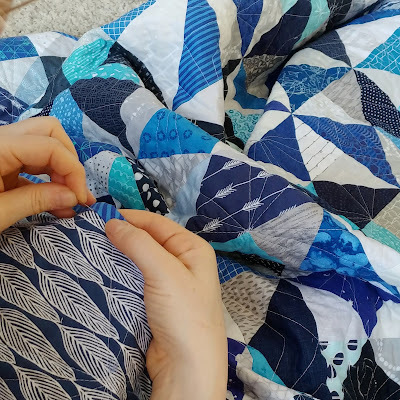 I started it over 3 years ago during a quilt-along (the Glisten-along), but wasn't able to keep up and ran out of motivation once the quilt-along was over. It sat collecting dust in some kitchen serving trays for over two and a half years and so was one of the top projects on my list of proposed finishes for this quarter. 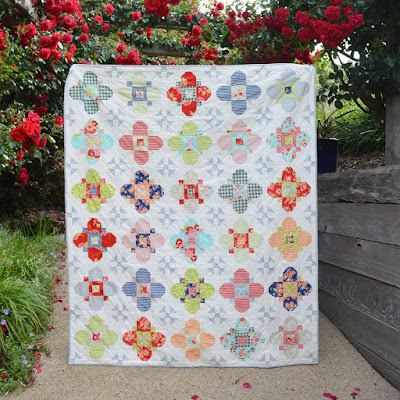 The quilt is made with prints from the Miss Kate collection by Bonnie and Camille, and while I love the collection, I didn't have very many of the prints and so struggled to get good contrast within the blocks and also felt that there wasn't enough variety in the quilt. The scale of the prints probably weren't a great match for the sizes of the pieces either. 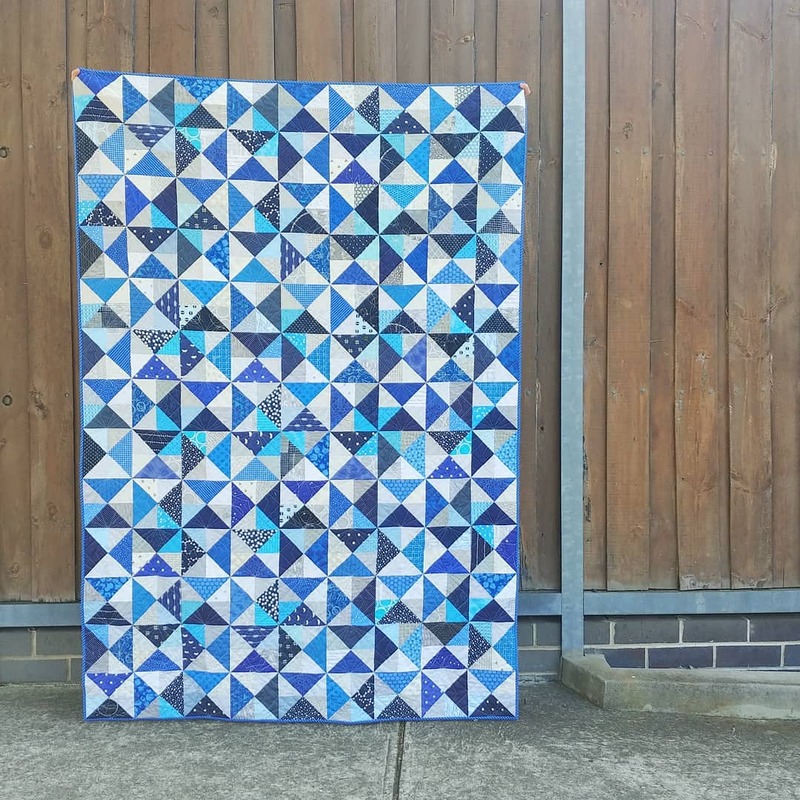 However, finished is better than perfect and I thought it would be better finished and donated to a charity than continue collecting dust. 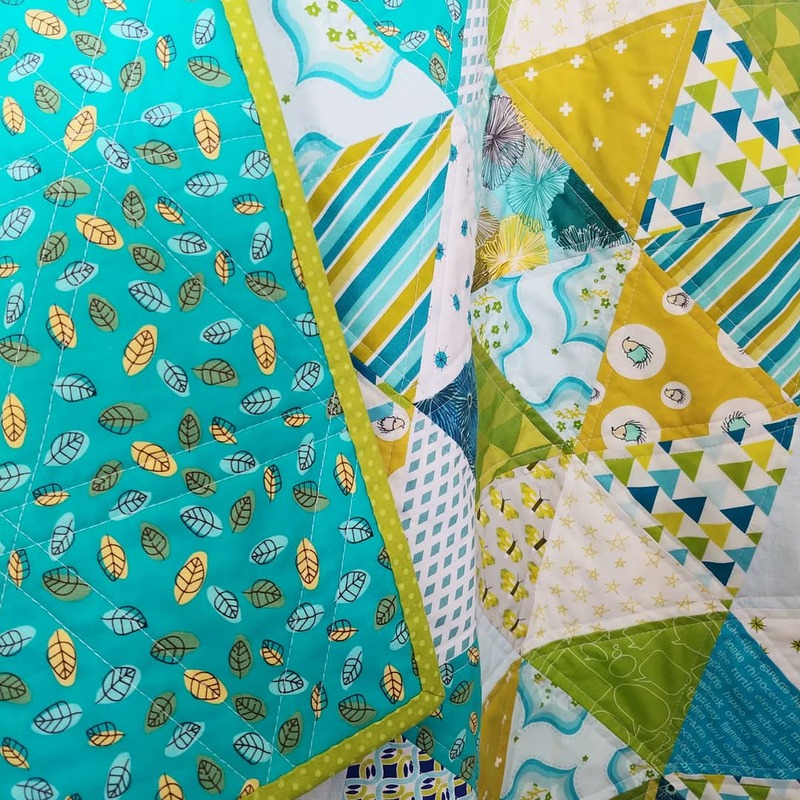 I put the blocks together (without the border) and finished it with a minimal amount of straight line quilting. 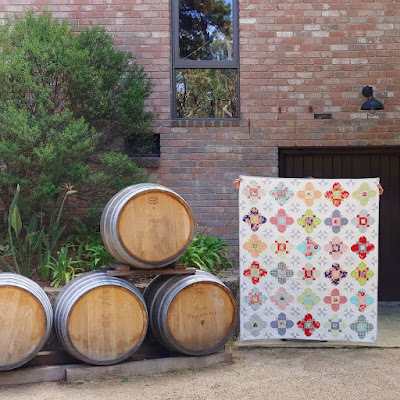 My finish happened to coincide with a trip to a winery for my Mum's birthday lunch so I was at least able to get some nice photos, even though it's not the nicest quilt. I plan to donate it to the Very Snuggly Quilts program where it might find a loving home with a teenage girl. 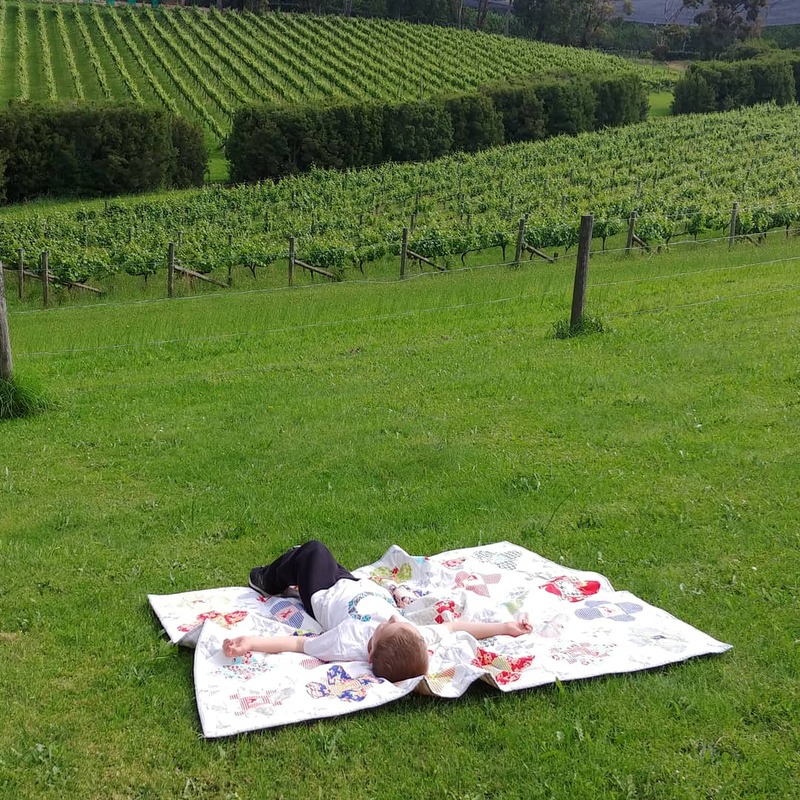 Mr 6 certainly doesn't mind it. 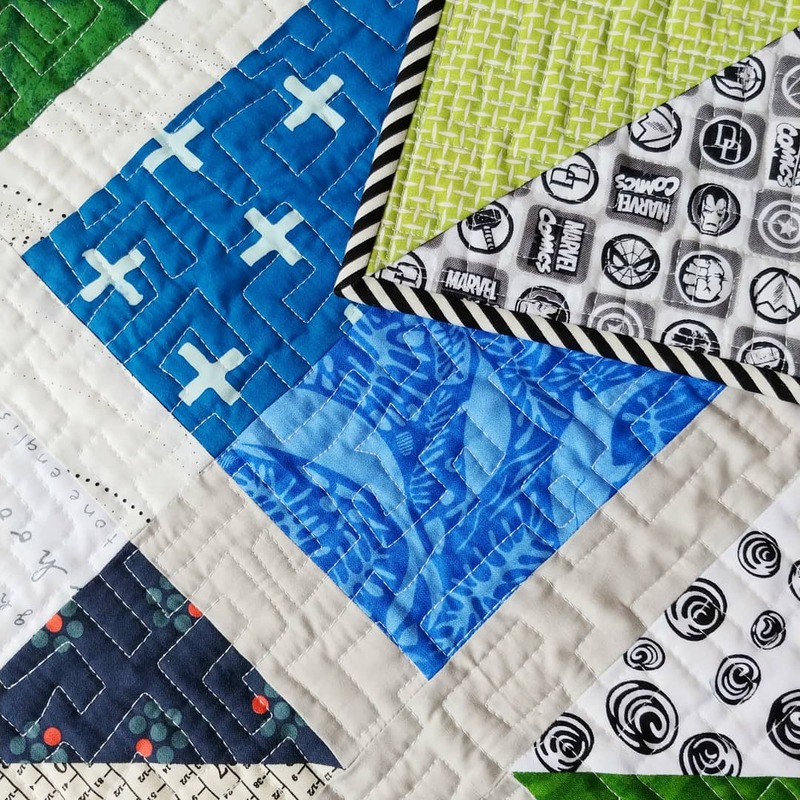 Another 2018 finish I haven't yet shared is a checker block quilt I made as part of one of my 2018 quilting bees. 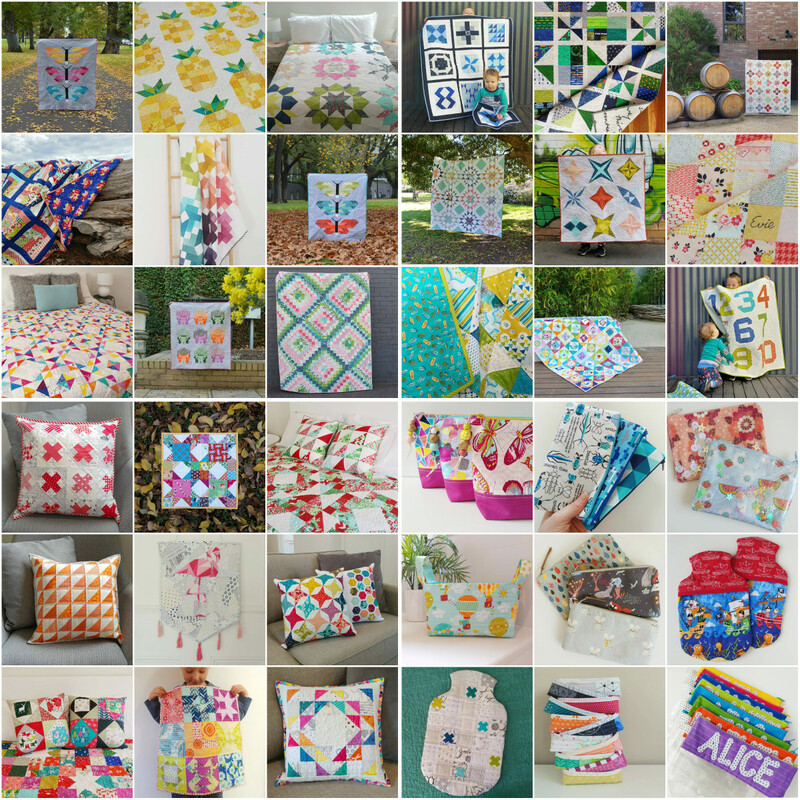 Our bee was made of 8 quilters from Australia and New Zealand and at the start of the year I suggested that we use some of our spare months to make quilts for charity. 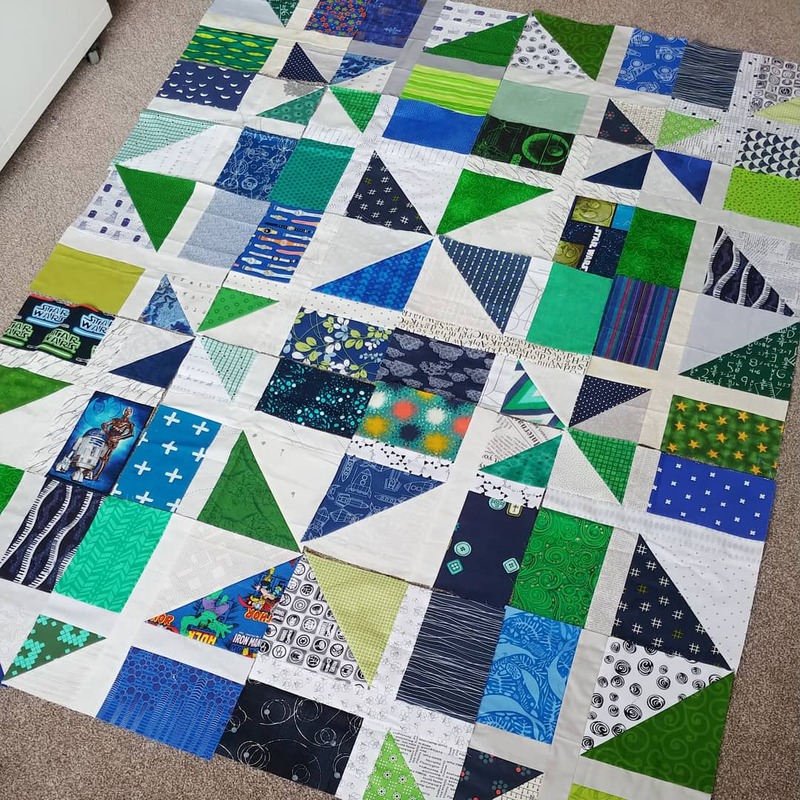 For our September project, I asked the bee members to make checker blocks in blues, greens and low volumes, using prints that would be suitable for a teenage boy. These were the sample blocks I put together. 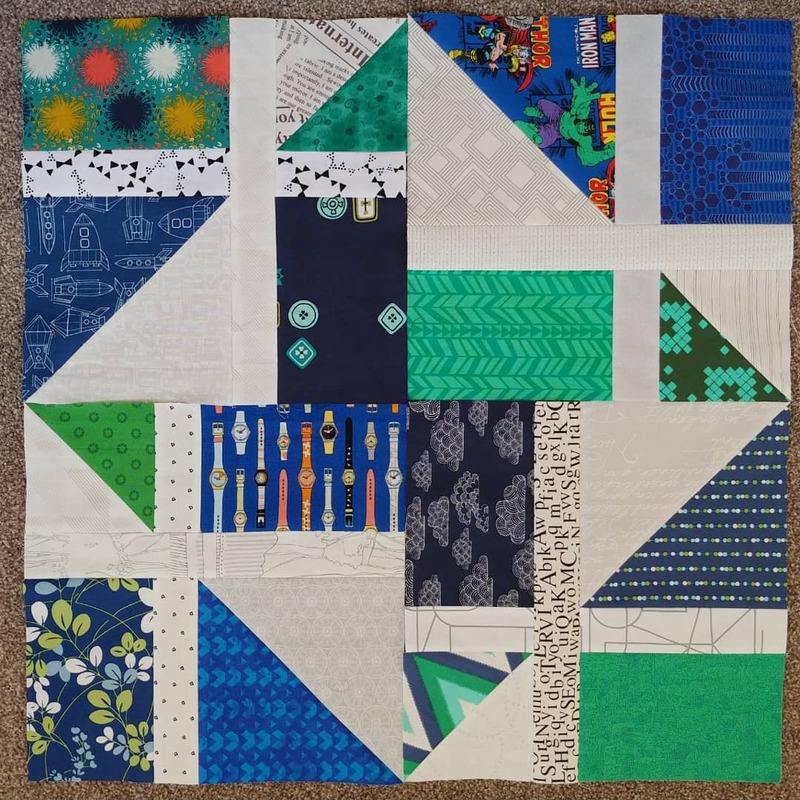 I received 16 fabulous blocks from my bee mates and had a great time playing around with the different layout options. I finished the quilt using an allover boxy stipple and some classic black and white striped binding (my favourite kind of binding). For the back I used the IKEA number print - another favourite of mine and great for a teenage boy. We donated the quilt to the Very Snuggly Quilts program, who give quilts to long term patients at the Royal Children's Hospital. 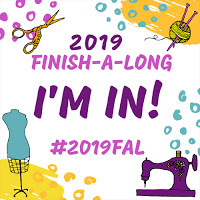 The VSQ program often struggle to find enough quilts for older boys , so one of my 2019 goals is to make and donate more quilts for this group. 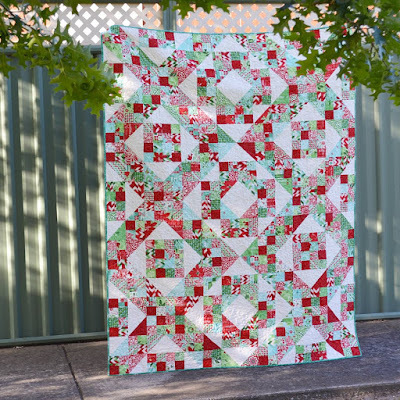 I'm linking up with the Q4 finish-along, as this project was on my list for quarter 4. 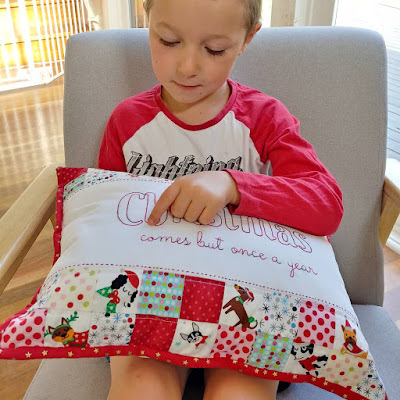 Before Christmas I participated in the Saturday Night Craft Along swap and was completely spoiled by my partner Tracee, who made me this beautiful stitched cushion. My oldest son loved it so much that the only way I could get him to hand it over was to promise to make him his own Christmas pillows. 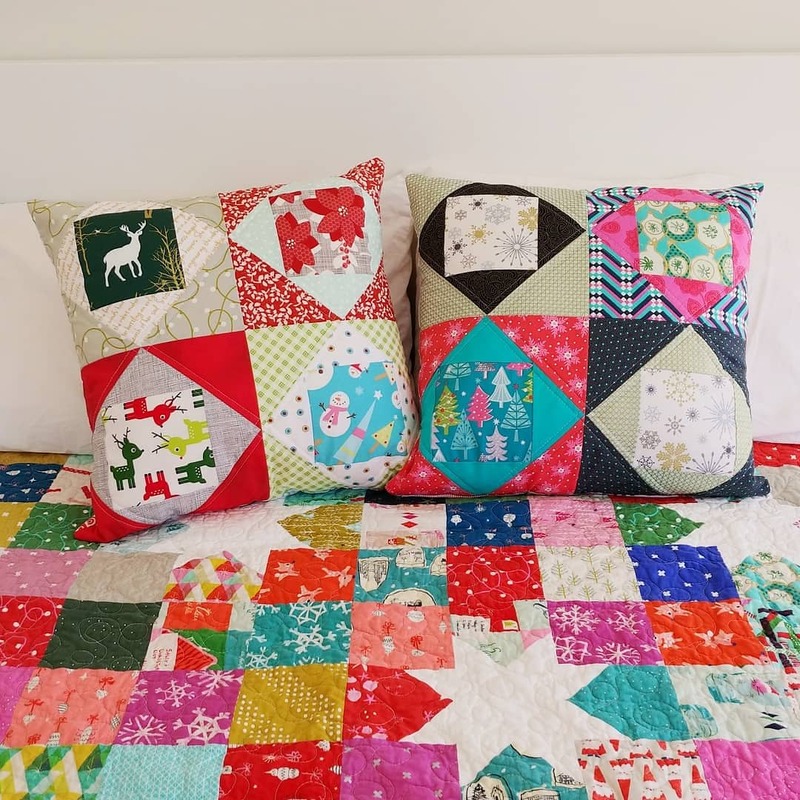 Given that there was only a few days left until Christmas, I pulled out a WIP from my Q4 finish-along list and turned it into a quick pair of pillows. My economy blocks from a swap last year were perfect and are a good match for the C+S Christmas quilt I made a couple of years ago. 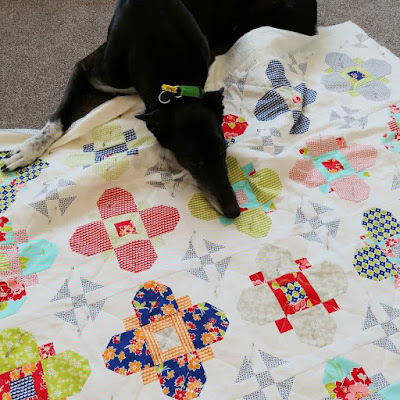 My little was happy with his pillows and I was happy to have another finish under my belt. Win-win! 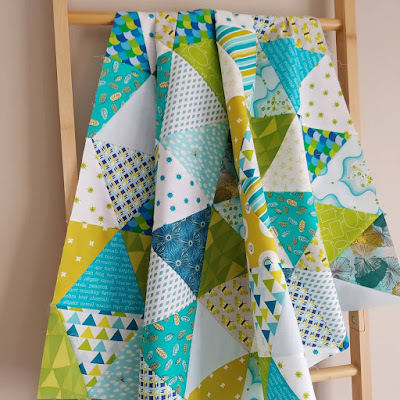 First on the list of finishes from my quarter 4 proposed list was a baby quilt for a colleagues little boy made from equilateral triangles in a scrappy palette of blues, greens and mustard. 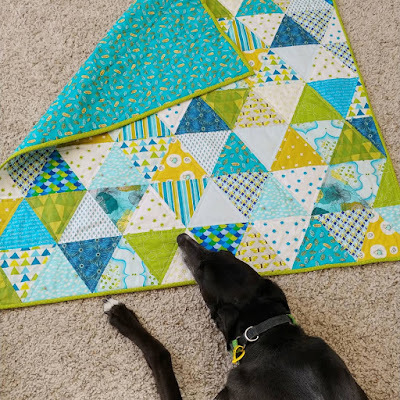 I finished this one with some simple, straight line quilting either size of the seams and bound it with a bright green spot I've had in my stash for ages. 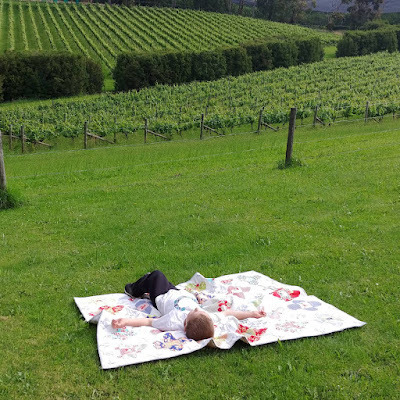 Perfect for a small boy (or a large dog). I'm looking forward to trying this pattern again in some different colours. One of my 2019 goals is to be braver with mixing prints in different colours and patterns and by different designers etc.